Millions of people around the world own an Amazon Kindle reading device. Its original e-ink reader revolutionised the ebook market and kicked off a wave of copycat devices. 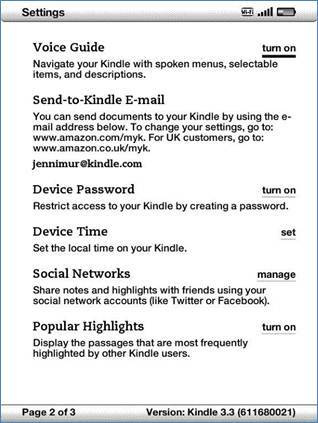 As well as buying content for your Kindle ereader, you can also use it to read PDF files that you’ve downloaded, created, edited or purchased. But before you start transferring files, your PDF needs to be in good shape. Infix PDF Editor includes a range of useful tools that make PDF preparation simple. Remember: you can also use Infix PDF Editor to convert other file formats to PDF for easy Kindle viewing. A PDF downloaded from the internet has probably been designed for two things: viewing on a computer and being printed onto paper. The Kindle presents a few new challenges: it’s got a smaller viewing area, for a start, and it’s also more limited in how it displays content. If you spend time working on your PDF before transferring it to the Kindle, you’ll enjoy a more pleasant reading experience. In Infix PDF Editor, you can edit any PDF before it’s sent to your Kindle. Infix PDF editor can edit pre-formatted text, scanned text, images – pretty much any content, whether it was created by you or not. You can also use the software to convert other formats to PDF. Image size. While the Kindle also allows you to zoom in to a PDF, it’ll add ugly scroll bars to the sides of the screen, and moving around the page can be very cumbersome. For the best clarity and quality, get the image size right in Infix before transferring the file. This is the single most important thing you will do to make your PDFs more readable. Font size. The Kindle has its own font size button, but you may want to standardise the font size in Infix to ensure everything can be read easily without too much fuss. Read this article about fonts for more details. Orientation. There’s a screen rotation option on the Kindle, so both landscape and portrait format can be accommodated. If you prefer to hold your Kindle upright, you might want to change the rotation in Infix and make any necessary edits. Language. Infix PDF Editor can be used with CAT software for easy PDF translation. There are plenty of tutorials on the actual transfer process, but briefly, there are two common ways to do this. USB. Your Kindle appears as a removable drive on the computer. Drag your PDF into the Kindle Documents folder. Email. Your Kindle has a unique email address assigned to it. You can change this address. Note that there may be a fee for the transfer. Note: if you use the email option, Amazon recommends typing the word ‘convert’ in the subject line when emailing a PDF. The results of a conversion are very basic – plaintext, basically – and the conversion process is extremely slow. You should be able to use Infix PDF editor to achieve a better result.